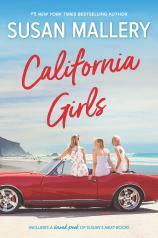 The California sunshine’s not quite so bright for three sisters who get dumped in the same week. Zennie’s breakup is no big loss. Although the world insists she pair up, she’d rather be surfing. So agreeing to be the surrogate for her best friend is a no-brainer --- after all, she has an available womb and no other attachments to worry about. Except…when everyone else, including her big sister, thinks she’s making a huge mistake, being pregnant is a lot lonelier --- and more complicated --- than she imagined. Never the tallest, thinnest or prettiest sister, Ali is used to being overlooked, but when her fiancé sends his disapproving brother to call off the wedding, it’s a new low. And yet Daniel continues to turn up “for support,” making Ali wonder if maybe --- for once --- someone sees her in a way no one ever has.